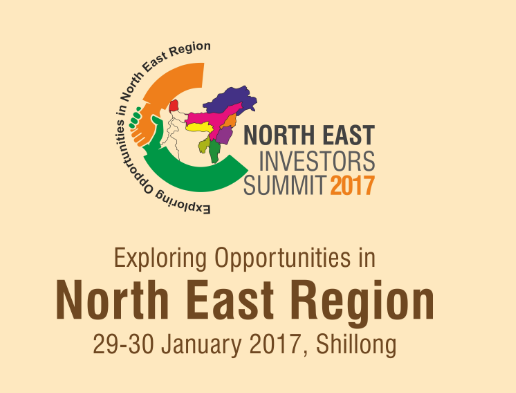 2-day North East Investors’ Summit in Shillong from 29th January 2017. The first ever “Investors Summit” exclusively for North Eastern Region (NER), organized jointly by the Ministry of Textiles and the Ministry of DoNER during 29-30 January, 2017, would be inaugurated by the Union Textiles Minister, Smt. Smriti Zubin Irani in Shillong, at the State Convention Centre, on 29th January, 2017. The Ministry of Textiles has taken the initiative to organize the first ever “Investors Summit” exclusively for NER, in association with Ministry of DONER and the Industry Associations FICCI and CII on 29-30 January 2017 at Shillong. Focussed on manufacturing in textiles and allied sectors, the theme of the Summit is “Exploring Opportunities in North East Region”. The summit aims to showcase the NER as a global destination for investment, and to explore the possibility of bringing in convergence of efforts of various central Ministries and North Eastern States to attract investment in NER. Summit will be attended by all North Eastern States, Export Promotion Councils, industries from North Eastern Region and leading investors across the country. The entire textile value chain from fibre to garment, including raw materials shall be represented in the Summit. The meet would witness participation of over 400 delegates from across the country.